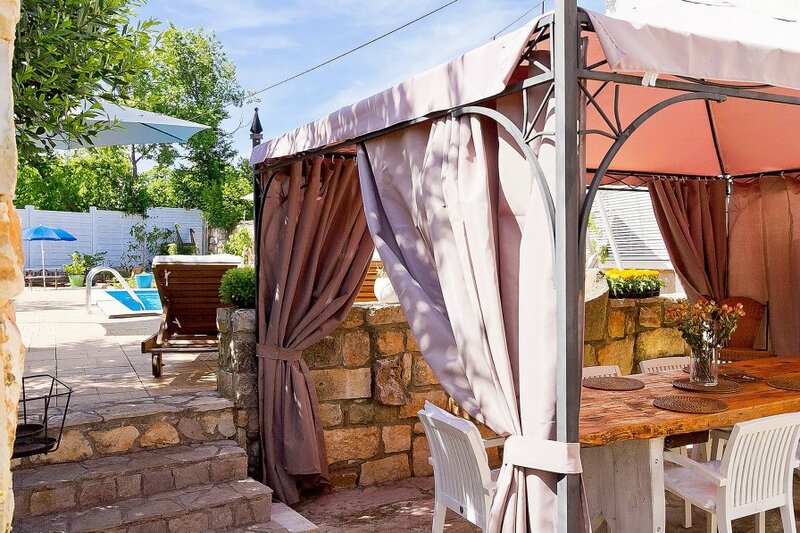 This 3-bedroom villa for up to 8 guests is located in Pula and has a private swimming pool. Marcana 11 km from Pula: Beautiful, rustic semi-detached house Villa Luna, 2 storeys. In the centre of Marcana, 8 km from the sea. Private: property 690 m2 (fenced), swimming pool angular (24 m2, depth 140 cm, 11.05.-30.09.). Shower/WC in the pool area, outdoor shower, table tennis, terrace, garden furniture, barbecue, children's playground (slide, swing). In the house: internet access, table football, washing machine. Available: bicycles (3). Parking at the house on the premises. Shop 100 m, restaurant 200 m, pebble beach Duga uvala 8 km, rocky beach 8 km. Sports centre 8 km. 4-room semi-detached house 168 m2 on 2 levels. Rustic and tasteful furnishings: living/dining room 80 m2 with 1 double sofabed (160 cm, length 200 cm), satellite TV and DVD. Exit to the terrace. Open kitchen (4 hot plates, oven, dishwasher, microwave, freezer, electric coffee machine). Exit to the terrace. Upper floor: 1 room with 1 french bed (160 cm, length 200 cm), air conditioning. 2 rooms, each room with 1 french bed (160 cm, length 200 cm), air conditioning. Bath/WC, shower/WC, whirlpool. Terrace 50 m2, roofed. Terrace furniture. View of the garden. Facilities: children's high chair, baby cot. Internet (WiFi, free).